I’ve recently been reading Eve McDonald’s book ‘Hannibal, a Hellenistic Life’. I’m not very well up on Roman Republican History, so it’s fascinating to fill this gap in my knowledge. But I also came across some old friends – the Mamertini. The Mamertini were a tribe from Samnium or Campania (the ancient sources differ), who were hired as mercenaries by Agathocles, who was the tyrant of Syracuse, on Sicily. The problem with soldiers, of course, and especially mercenaries, is that they tend to cause trouble when at a loose end. In the case of the Mamertini, they took over Messina. When the Syracusans tried to turf them out, they appealed to first the Cathaginians and then the Romans to help them. After the Carthaginians had already turned up and occupied Messina, the Mamertini decided that the Romans were a better bet, and ejected them. The Carthaginians teamed up with the Syracusans, and the stage was set for twenty-three years of war between the superpowers of the Mediterranean, which is now known as the First Punic War (264-241 BC). This is all particularly interesting for me because the Mamertini were – originally at least – Oscan speakers. I wrote a bit about them in my book, but I hadn’t realised that they occupied such a key place in Roman history. 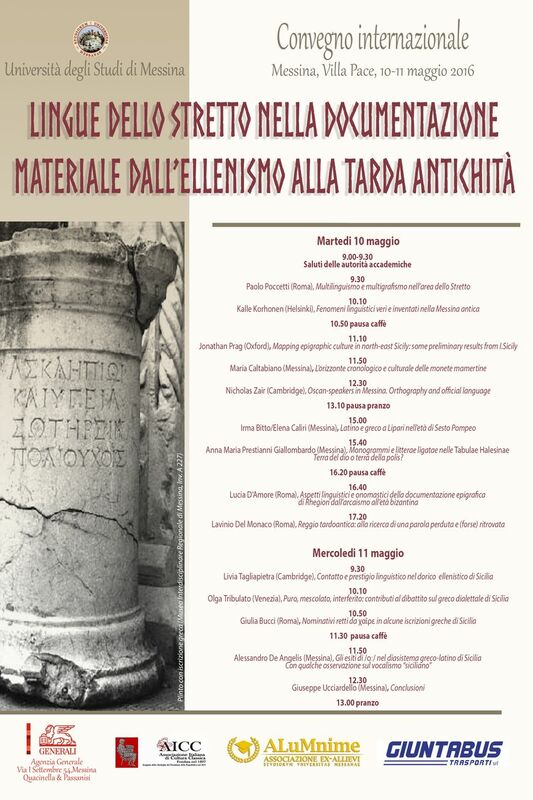 It’s also very timely, because I’m going to Messina in a couple of weeks to attend a conference on the ‘Languages of the Strait of Messina in Material Documentation from the Hellenistic Period to Late Antiquity’ where I’ll be discussing in some more detail the Oscan inscriptions that remain from the time of the Mamertini (all seven of them!). Since Messina is one of the few examples we know of where an Oscan-speaking group took over a city with a Greek-speaking population, there’s been a fair amount of discussion about whether the Oscan inscriptions from Messina show any evidence for the relationship between Greek and Oscan in this area. Unfortunately, as so often, our interpretations are heavily dependent on fairly uncertain material. I’ll report back after the conference on what I and other people said, but for the time being I’ll just give one example. One of the arguments rests on how the name works on the inscription below. It reads ‘-s son of Stennis. Of Apollo’. How it’s understood all depends on whether there’s the remains of the right hand stroke of an A before the Σ in the first line far left: what do you think? (The picture was taken on our research trip in 2014, at the Museo Regionale Interdisciplinare di Messina. We’re very grateful to the staff there for their kind assistance). 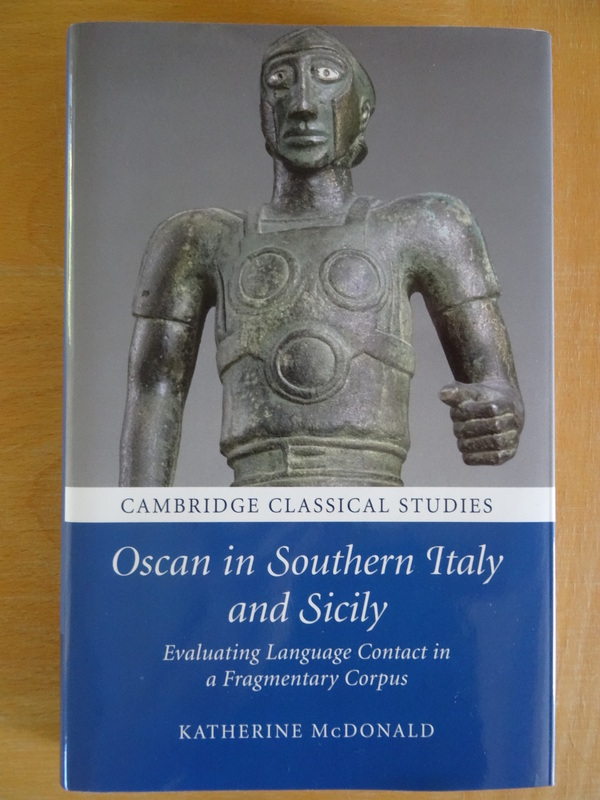 Categories: Campania, Epigraphy, Languages, Oscan, Research, Sicily | Permalink. Now, this map does the job in many circumstances. It gives a rough indication of the location and extent of the languages of ancient Italy, taking a point around the fifth or fourth century. But – as I’m sure everyone is getting tired of hearing me say – there are some problems here too. The map gives the impression that there are clear borders between the languages, and that there was no bilingualism or language contact. It also buys into the Roman idea of large ‘tribes’ speaking the same language across wide areas, rather than individual communities and city states each doing their own thing. If we’re not careful, the map also gives the impression that these boundaries were static and unchanging – who would guess from this map, for example, that Etruscan extended down to Campania at its greatest extent? This kind of map is more honest to some extent, since it gives a general impression of where each language is found without suggesting that we know exactly where the borders between languages. It also leaves some blank space in places, where there’s little or no evidence. But otherwise, it has the same problems as the first map – large areas each given one language, with no clear evidence of contact or change over time. Until recently, I’ve contented myself with complaining about existing maps – but I’ve realised that for my Language Contact in Ancient Italy project, just poking holes in other people’s work is not going to be sufficient any more. And so, I’ve been making some maps. The first task was to create a spreadsheet (or rather, a lot of spreadsheets…) which gave the locations and dates of all the inscriptions in Italy. There’s no one book that has this information, so it takes a certain amount of time to collate the information from lots of different sources. Fortunately, I’d done a lot of that work for previous research anyway. On this map, every colour represents a different language (more or less). Dots show sites where that language is present. Stars show sites where there is more than one language present (at any period, not necessarily at the same time). If we zoom in on a particular area, such as the Bay of Naples, you can see that if I click on a dot or star, you get some additional information about the languages and the time periods when they appear. So, if I click on Pompeii (a star), it will tell me that the languages there are Etruscan and Oscan. These images are much less interactive than a Google map, and with less information – but I’m hoping that people will eventually be able to use the two together. At some point I might even make a little animation of the century-by-century images, to show the changes over time. All of this might seem like just gathering existing information together rather than creating anything new, but it’s already made me much more familiar with languages I know very little about, and given me a fresh perspective on the regions I thought I knew quite well. And for me, the insight into our evidence for ancient languages is completely worth the effort. On these maps, you can see that our evidence exists only as dots on a map – lots of blank space, lots of unknowns, and lots of overlaps. So what is there left to do? Well, you might notice that Greek and Latin are conspicuously absent, apart from the black dot where I’ve marked in the city of Rome. (Is it a telling indication of my subconscious feelings about Latin that I’ve given it the Black Spot?) My next task will be to put together a list of the Latin inscriptions of Italy up until around 44 BC which – I’m hoping – shouldn’t actually take too long, given how many are found in and around Rome. Still, there’s plenty of Latin, and it will take a little while to put the evidence together. 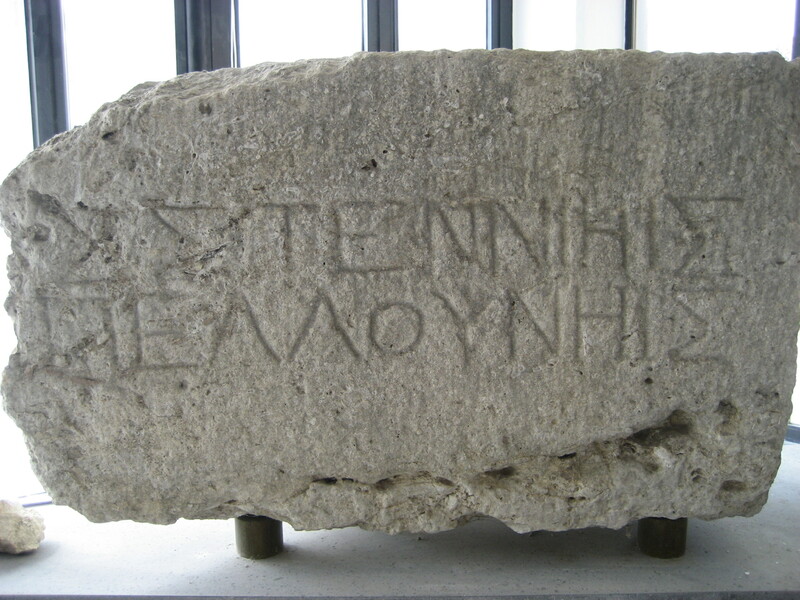 Greek is potentially a more difficult task, since there the relevant inscriptions are spread among many more sites and publications. But I’m very luck that our PhD student Livia has a working list of all the Greek inscriptions in Italy that she is letting me use. So hopefully before too long I’ll have a finished and functional set of maps to share. If you’d like to play around with the Google map, please do – I’m hoping that eventually these maps will be resources available for everyone to use. And let me know below if you spot any mistakes or would like to request any additional features that would be particularly helpful. I’ve also made an effort to make these maps easy to use for colour-blind readers, but if that applies to you and there are sections of the maps which are unclear, please let me know. Categories: Languages, Research | Permalink. The funding for the Greek in Italy Project is generously provided by the Arts and Humanities Research Council UK and we submit an annual report to them saying what we have been up to, listing our published outputs and all sorts of activities under ‘engagement’. This year, there is a new web-interface for reporting to the AHRC, and our report will be submitted in the next couple of weeks. 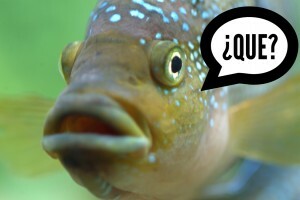 The web-interface is called ‘Researchfish’ (clear echoes of Douglas Adams’s Babel fish) and designed for use by all Research Councils and other bodies that fund research in the UK. It is on the whole easy to use, and involves much less time than writing a narrative statement of all the different things which we do as part of the project. My only complaint about the system is a peevish grumble that it is so clearly devised by and for research funded by ‘Big Science’: medicine, the physical and chemical sciences, engineering etc. Mistakes like this are trivial, but they feed into an impression that what is really important in the reporting is the delivery of quantifiable and marketable ‘products’, and that the only valued impact is impact which can be measured in monetary terms. You can fill in boxes with what you tell schoolchildren with any rubbish at all, and no one really minds, because giving school talks doesn’t contribute to the national economy in the way that developing a new patent does. The best result of a school-talk is to encourage more children to become money-spinning scientists. Categories: Funding, Research | Permalink.